As a stained glass artist based in Philadelphia, PA I explore how I can bring new light and color to contemporary spaces. Stained glass is a unique medium in the wonder of its materials and in its unusual design limitations. I enjoy the challenge that this creates, and love the surprising beauty that results. In 2017 I installed my first Public Art project at Lovett Library in Philadelphia. This project was part of Philadelphia's Percent for Art initiative. 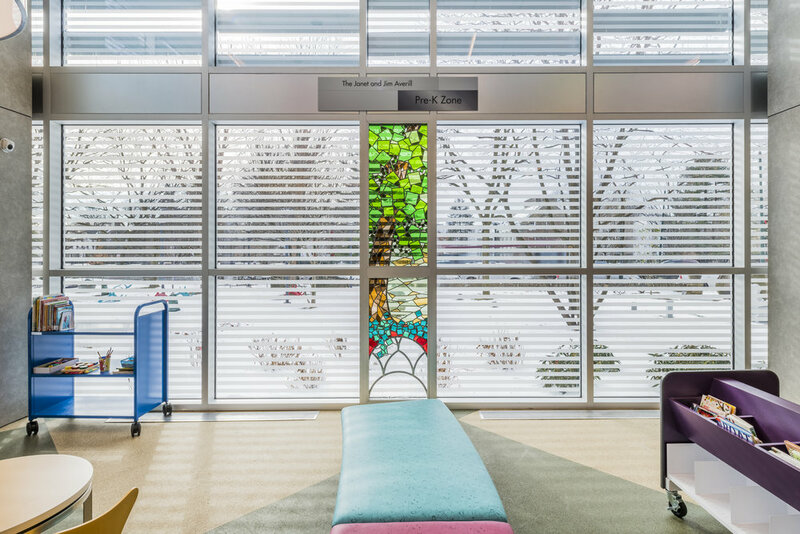 The design process involved community, stakeholder, and city interactions, and resulted in a series of windows that reflect the community’s love of its natural surroundings and the joy of exploration and imagination. The 2 installations at Lovett draw on themes of curiosity, exploration, and the uniqueness of the neighborhood of Mt. Airy. Panel 1 of "Explore", a 17' long frieze of windows at Lovett Library in Mt Airy, Philadelphia, PA.
Panel 2 of "Explore", a 17' long frieze of windows at Lovett Library in Mt Airy, Philadelphia, PA.